GVS has taken and expanded its frontier of hardware design and integrated it with world class software to deliver clients a compact 1U-16U rack mount platform offering quick, in-house secure access to the power of 64-1024-core highspeed processors. GVS Render Farm technology leverages the power of the UNIX-based foundation and directory services architecture to streamline configuration¡ X while administration tools make it easy to manage, submit jobs, monitor progress and retrieve results. For optimization, the Render Farm Queue is a priority based, distributed network render queue that can manage and distribute processing of command line based tools such as compositors and render on small and large networks. No matter what your core application or rendering need, from After Effect, Maya, Mental Ray, Renderman, or any CGI application you have a solution to save a great amount of processor intensive time. 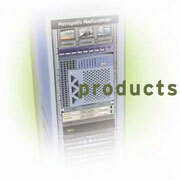  Support for multiple platforms including Windows,R Linux, Mac OSX, Solaris and VMware ready.  Dual Fiber channel or 10Gigabit connection to server and Nomadic RAID storage delivering a data I/O rate of 10 Gbit/sec.  Highly sophisticated bandwidth through dual channel Gigabit enables GVS Render Farm to send and receive data and management compounds from server nodes, without clogging the network.  Extreme user-friendly graphics interface allows Administrator to stop, pause, resume or delete jobs or partition available agents into separate clusters, allowing different groups to share a single controller without interfering with each project and remain completely anonymous to groups of users on the Render Farm Grid, while still having access to processors in the Grid.  GVS Render Farm automatically detects when an agent is no longer accessible and reassigns the task to another system. Essential job information is cached on disk, so your Render Farm Grid can resume work immediately if you should ever need to reboot a render node.  Optional controller accessible from the public Internet so any system can join the Render Farm just by using your hostname or IP address, enabling secure authentication without passing passwords over the network. GVS Render Farm is the first distributed computing architecture to be built into a server operating system. Configured to plug or remain stand alone in your secure network infrastructure, the GVS Render Farm has scalable up to 2.2PB storage designed so you don¡¦t have to worry about your storage needs. And while GVS Render Farm is easy-to-use and artist friendly, as well as simple to administer, technically savvy power users can exploit the command line interface by creating 'wrapper scripts' or custom GUIs to dovetail GVS Render Farm into existing production pipelines. With GVS Render Farm, scientists, engineers, animators and digital content creators can run a single job across clusters of computers at once. Users can browse for batch files or scripts. Child Process Priority Class selection allows you to control the priority that Render Farm will give to the actual renders it launches. Check the Launch spawned processes with visible windows button if you want the output from this type of render to always be visible on the screen. When a job of this type starts, GVS Render Farm will open an Output Window for the job, and you can monitor the status. The window will automatically close when the render finishes. Web browser status also shows when the jobs are completed. When a render node dies or is removed, the management tools remove the entire job automatically and reassign it to the next available processor. GVS Render Farm also has the ability to generate reports to better help estimate project time line and cost ie: How long the job took from start to finish, How many CPU hours were involved in total, The start/end time for the job while rendering. To make this system and licensing available to any user for a given time line or project, GVS also offers a rental option for the software creating an extremely affordable, cost saving solution for last minute crunch-time projects.